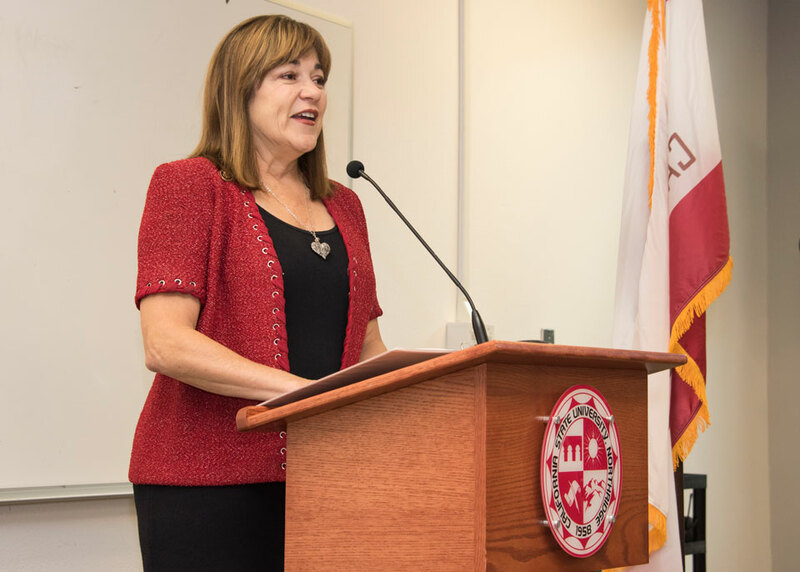 Orange County U.S. Rep. Loretta Sanchez, a candidate for the state’s first open U.S. Senate seat in 24 years, makes a stop at CSUN on the morning of Nov. 1, 2016, to participate in the university’s Candidate to Campus series, sponsored by the CSUN Office of Government and Community Relations. 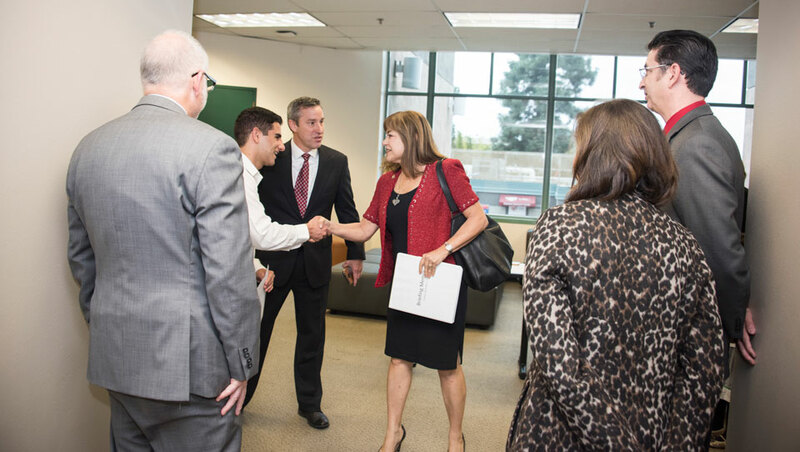 Sanchez (center), meets and shakes hands with Associated Students President Sevag Alexanian, as CSUN administrators including Robert Gunsalus, vice president of University Advancement (third from left) greet the congresswoman at the University Student Union. Photo by Lee Choo. Orange County U.S. Rep. Loretta Sanchez, a candidate for the state’s first open U.S. Senate seat in 24 years, makes a stop at CSUN on the morning of Nov. 1, 2016, to participate in the university’s Candidate to Campus series, sponsored by the CSUN Office of Government and Community Relations. Photo by Lee Choo. California Attorney General Kamala Harris, a candidate for the state’s first open U.S. Senate seat in 24 years, makes a stop at CSUN on the afternoon of Nov. 1, 2016, for a get-out-the-vote rally sponsored by the student group CSUN Young Democrats. Her husband, Doug Emhoff ’87 (Communication Studies), an attorney and CSUN alumnus, looks on (standing, far right). Photo by David J. Hawkins. California Attorney General Kamala Harris, a candidate for the state’s first open U.S. Senate seat in 24 years, makes a stop at CSUN on the afternoon of Nov. 1, 2016, for a get-out-the-vote rally sponsored by the student group CSUN Young Democrats. 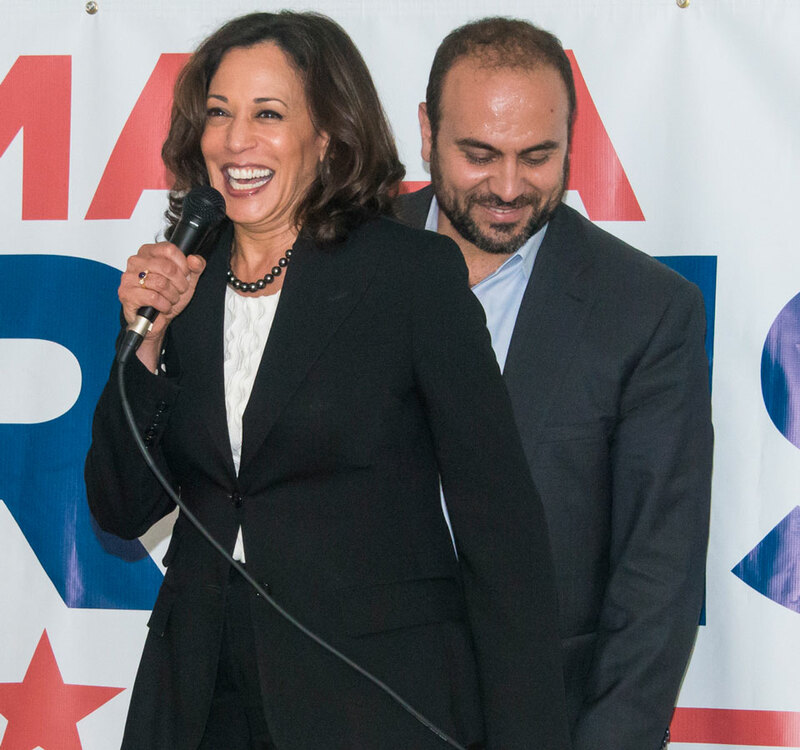 State Rep. Adrin Nazarian (right) helps introduce Harris. Photo by David J. Hawkins. Just seven days before the historic presidential election, California State University, Northridge students and faculty had a rare opportunity to meet, question and pose for selfies with California’s two candidates for U.S. Senate — Orange County U.S. Rep. Loretta Sanchez and state Attorney General Kamala Harris. The two Democrats are vying for the state’s first open Senate seat in 24 years, to replace retiring four-term Sen. Barbara Boxer. The race is historic in its own right — the victor will be the first woman of color to serve in the Senate in the nation’s 240-year history — but has received little attention, under the heavy shadow of the unprecedented presidential election and, perhaps, because Harris has held a commanding lead in the polls all year, according to CSUN political science professor Tyler J. Hughes. Sanchez made a stop at CSUN on the morning of Nov. 1 to participate in the university’s Candidate to Campus series, sponsored by the CSUN Office of Government and Community Relations. The Candidate to Campus program is designed to give candidates seeking office impacting the greater San Fernando Valley region the opportunity to become acquainted with the university. The Nov. 1 morning forum at the University Student Union attracted CSUN students from journalism, political science and other courses, and their professors. “This is an opportunity for elected officials to know not only what makes CSUN tick, but how we can form partnerships to bring California to the next level,” said Francesca Vega, director of government and community relations, as she introduced Sanchez. Sevag Alexanian, president of Associated Students, also helped welcome the Orange County congresswoman to campus. Sanchez focused most of her remarks on her education agenda and talking about her upbringing in Anaheim in a family of seven children (she is the second oldest) and being the daughter of Mexican immigrants. Her father was a union machinist and her mother worked as a secretary. All of her siblings earned college degrees, Sanchez said. “After she educated all seven of her children, my mother went back to school and got her B.A. at Cal State Fullerton,” Sanchez said. If elected to the Senate, Sanchez said, she would work to secure more funding for Pell grants and push to allow college graduates to consolidate their student loans to a 3 percent interest rate, “in the same way parents get to refinance their homes and bring their rates down to 3 percent. “My husband and I have eight children, and they’re between the ages of 22 and 34 — once, we had five of them in university at the same time — so we know what it’s like, even today, to try to go and get an education,” she said. She also zeroed in on research, and the funding for university research that comes from the federal government. She also spoke about funding free tuition for community college students. Just four hours later, Harris and her campaign caravan arrived on campus for a get-out-the-vote rally — sponsored by the student group CSUN Young Democrats — which included state senate candidate Henry Stern, state Assemblyman Adrin Nazarian and Harris’ husband, Doug Emhoff ’87 (Communication Studies), an attorney and CSUN alumnus. “I’m so excited to be here! Because the love of my life, my best friend, is a Matador,” Harris told the crowd of students, members of the community and members of the press packed shoulder-to-shoulder in a classroom at Jacaranda Hall. 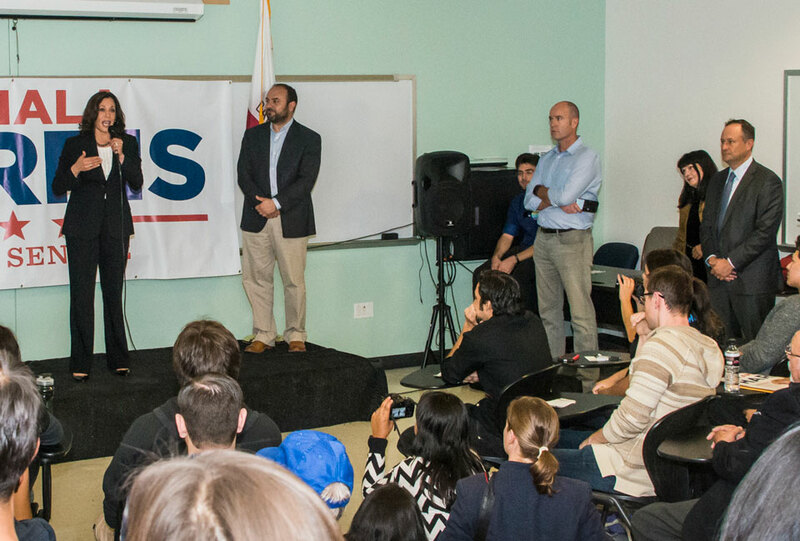 Harris appealed to the students in the room to get out and vote in the historic presidential election — and encourage other Californians to do so. “People say, ‘young people — wish they’d get out and vote, but they really don’t … are they paying attention?’ I know the truth, which is yes, yes, yes,” the attorney general said. “So here’s the deal: Seven days before the election, that’s where we are. We’re here to talk about the issues, but really to ask for your help to turn folks out — and remind them that their voice is their vote and their vote is their vote. “I think we are at an inflection point in the history of our country,” she continued. “My parents met back when they were students at UC Berkeley when they were active in the civil rights movement. I think we are at a moment in time that is similar. … I believe we are a great country, imperfect though we may be. Part of what makes us great is we were founded on certain principles, on certain ideals. Ideals that were, for example, written and spoken in 1776, that says we are all and should be treated as equals. “The ideals of our country are what is at stake in this election, and each one of us is being challenged to stand up and fight for our ideals,” she said.